The reception for the Third World Kyudo Taikai was held at 18:30 on April 23, 2018, a day before the competition. The venue was Meiji Kinenkan [Meiji Memorial Hall], where the Imperial Council developed a draft of the Meiji constitution in the main building in 1881. Since it was also used as the temporary imperial palace, it is known as a place associated with the Imperial family. 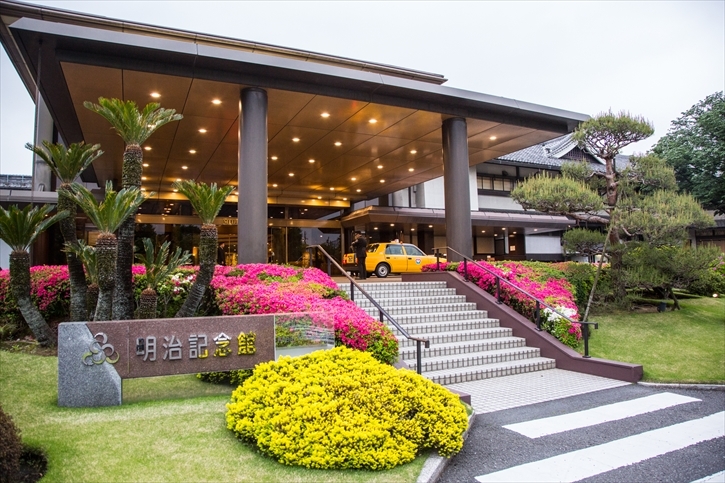 Despite being located in central Tokyo and in walking distance from the major commercial areas such as Aoyama or Shinjuku, Meiji Kinenkan has a vast yard of approximately 3,300 square meters with about 2,000 trees of 50 different kinds. They show us different scenery of Japanese nature in each season. Approximately 300 participants and officials were welcomed by this beautiful and invigorating nature and their enthusiasm for the competition were naturally raised. After dark, the participants and officials gathered in Hourai room. 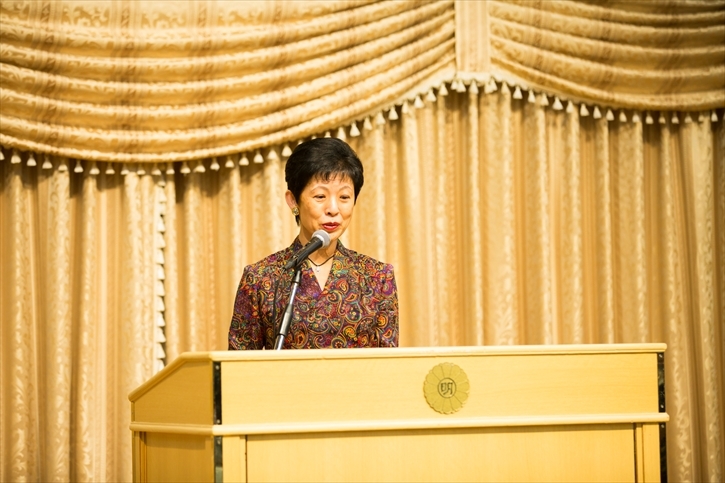 Upon the arrival of the honorary president of the International Kyudo Federation, Her Imperial Highness Princess Takamado, the reception started. After having a pleasant talk, the participants watched a video that conveyed the Spirit of Kyudo. 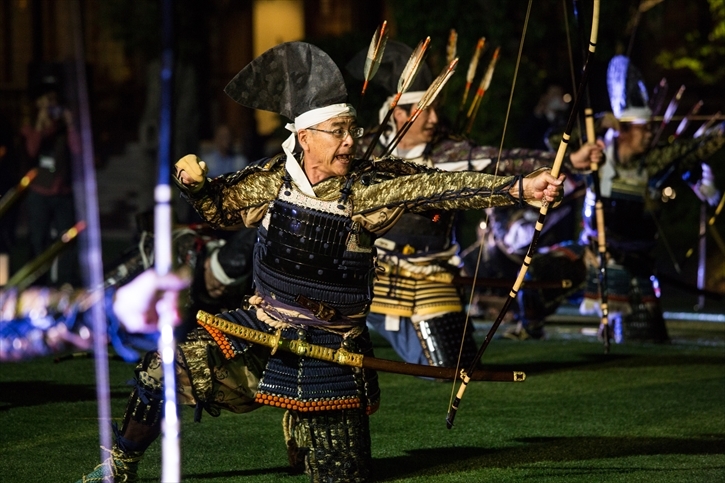 It showed how the Japanese bow, developed in warfare, made the transition from Waza [techniques] to Do [way], which is associated not only with Kyudo but also with other arts such as Sado [tea ceremony], Kado [flower arranging], Shodo [Japanese calligraphy], and Noh [traditional masked dance-drama]. The participants seemed to have been deeply impressed with its philosophy. Humbled, they were bracing their nerves for the next day. 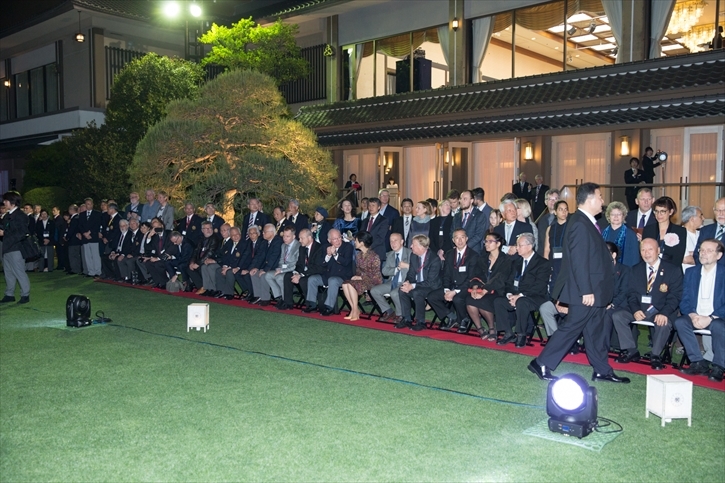 Following this screening, the participants listened to a welcoming speech by the president of the International Kyudo Federation, Hideya Nakano, a warmest remark by HIH Princess Takamado, a toast speech by the president of the European Kyudo Federation, Gerald Zimmermann, words of encouragement by the commissioner of Japan Sports Agency, Daichi Suzuki, and so on. 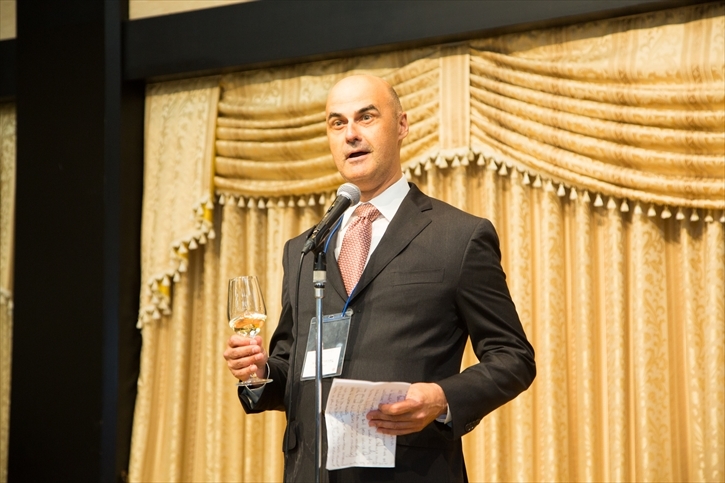 The participants and guests enjoyed the reception in a genial atmosphere, looking forward to the competition starting on the following day. 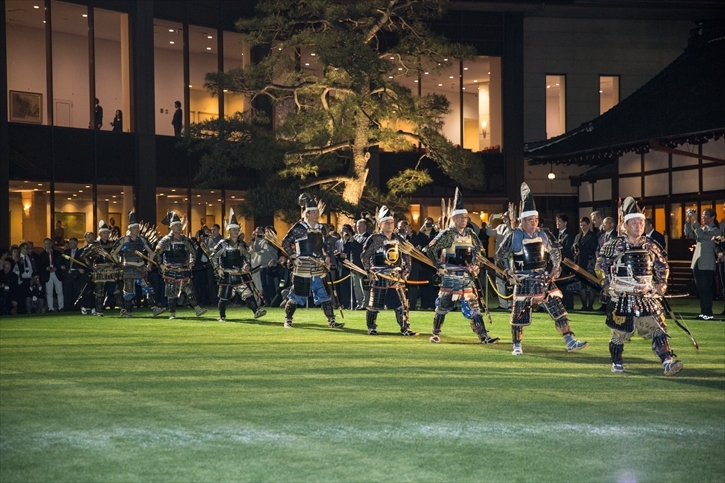 Soon Satsuma-Hekiryu warriors appeared in costumes and advanced in procession. The audience watched every movement. Warriors roar broke the silence. Then the warriors started demonstrating the archers’ movement in ancient wars. 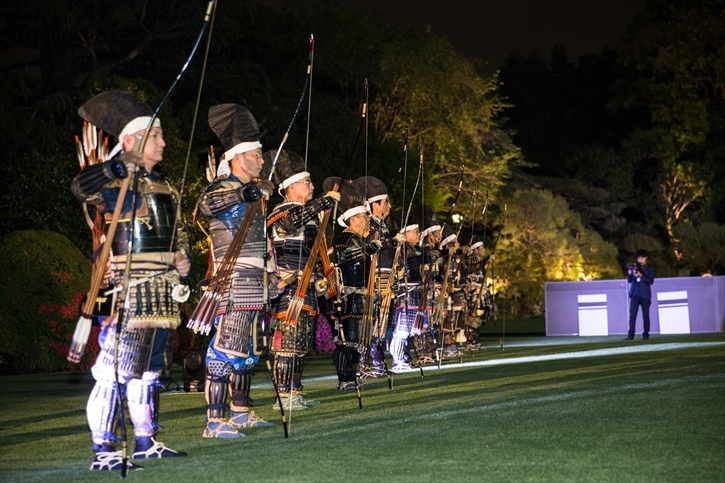 “Satsuma-Hekiryu Koshiya Kumiyumi” is developed in Izumi, Kagoshima, and was practiced in real battle by panoplied warriors. Shoot a bow, advance toward the enemy camp, shoot a bow again. Raid the enemy camp and then finishing off. Breathlessly watching their impeccable movement, the audience was enchanted with their regal posture. Once they returned to the room from the yard, the reception was nearing the end. The participants and officials enjoyed chatting for a while, then watched a video introducing casts and partners in the story screened in the beginning. They were witnessing that while its spirit has been passed down Japanese Kyudo has been made the shift from battlefields to Shin Zen Bi [Truth Goodness Beauty] over a long period of time. 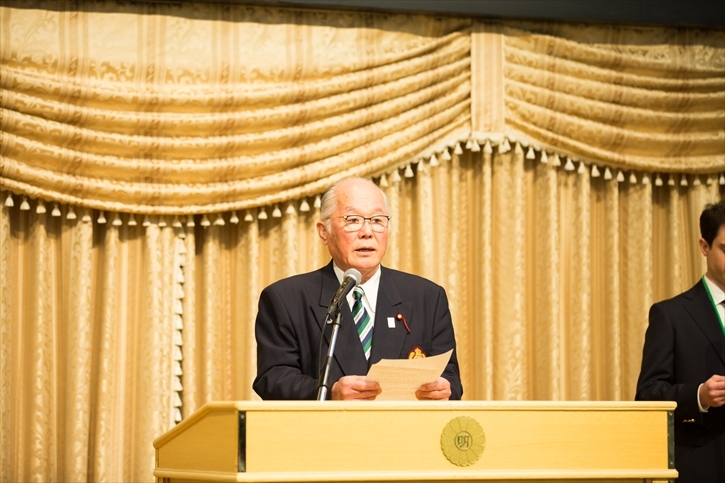 The reception lasted for about two and half hours and was closed by a speech from the former president of the International Kyudo Federation, Takeshi Shibata.